This thread is for discussing the design of the Trandoshan Huntmaster. First thing we need to do is finalize the name and then the Recommended Mini. The only entry in Wookieepedia for Huntmaster is in reference to Wookiees. I propose we call this mini Trandoshan Guildmaster instead. 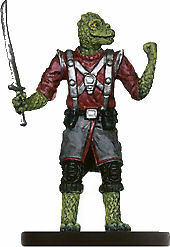 Guildmaster on Wookieepedia comes up with Craddosk, Bossk's father and head of the Bounty Hunter's Guild. For Recommended Mini, I propose Elite Trandoshan Mercenary. There are 8 Trandoshan minis, 3 of which are Bossk. We could use RS Bossk, but he is kind of small and I would think a Guildmaster should be larger. I second the Trando Elite (I swear every single pack of DT I bought had one of them, usually accompanied by the Clone with Repeating Blaster). It sounds like guildmaster refers to the bounty hunters guild, which isn't exactly what we're dealing with. I think Trandoshan Clan Leader may be more accurate, as the trandoshans had a clan based society. We can't really use bossk for a non-unique common/uncommon, as people don't tend to have bulk Uniques at the ready to proxy in. so, that leaves us with a few options. The whole point of this piece is to boost trandoshans. The Elite Trandoshan Merc is probably the best non-unique trandoshan we have. So, it is very likely that this new piece will be run with the Elite Tran Merc frequently. I actually suggest using the noghori or noghori commando. They look close to trandoshans, and there is less room for cross over. If we have to use a trandoshan, Trandoshan Scavenger has the lowest rating, worst stats, and seems the least redeemable of the lot. Especially if the CE ends up giving a bonus to rend or amush for double claw, he would benefit the least. I think limiting the character to be a booster for Trandoshans exclusively isn't really what I had in mind. I see it as a non-unique version of Cradossk, which would boost Bounty Hunters in some way, like S&V Crimson Nova Guild Leader. Obviously we have very different ideas. It is my opinion that all of the Trandos except a couple of marginal Bossks are complete write offs without any redeeming qualities, while there are plenty of good Bounty Hunters that could use a boost, as well as some already great ones that we'll have to watch don't get godly. Doing something for Bounty Hunters I see versatile options for squads, Trando boosting I see a theme squad that will have one version of that will never be used. Anyway, that's just me. If no one agrees with me, but they do agree with you, majority rules. I have loads of respect for anyone who puts forth ideas here and I hope difference of opinions will not turn people off the process. This is a collaboration after all. Right now we're just choosing names, but as is already clear, the name already limits what the design should appropriately be. Huntmaster I took to be referring to Bounty Hunters, and this character is a veteran Bounty Hunter. The fact that he is a Trandoshan is more of a flavor choice and I don't find it to be a coincidence that the leader of Bounty Hunter's Guild was Cradossk. I agree with this idea, makes allied Trandoshans even more aggressive, nice. However we are deciding on the name right now. I had totally forgotten about the Rodian Huntmaster from Bounty Hunters. Therefore with that precedence set, I am 100% for leaving the name as Trandoshan Huntmaster. GMA within 6? Would help old double attacking Bounty Hunters but do nothing for Cad who I'm most worried about. Old Boba's become awesome to use. Bossks become Awesome to use. TBSV precedence for CE. Whorm gets a huge boost, Living Seps still need help. Yeah that's why I didn't put forth a full set of stats - just wanted to illustrate to any who feel it has to be one or the other that it really can accomplish both simply and not be overpowering/complicated (also why I left the CE so open). My first vote would go to "Trandoshan Huntmaster" as well, if everyone likes that, i think it fits within the theme of what WOTC did... and may actually spark the creation of other Huntmasters in the future. Ally Bounty Hunters that moved their speed and killed an enemy gain Cleave. I prefer "Trandoshan Huntmaster" too. I know its a little long, but when I think of a huntmaster I don't think of them just hunting bounties. As for the RM the Trando Scavenger or the Mercenary from AE would work fine. For starters I definitely want to stick with Trandoshan Huntmaster. Second, if this is supposed to represent a non-unique Cradossk (and that's totally cool seeing as Cradossk really doesn't warrant a unique) then I think the Trandoshan Mercenary from Legacy is the best bet for a sculpt. Imho, the version from AE should be avoided since it leaves so much to be desired aesthetically. The Legacy version also lends itself to easy customization for a Cradossk look (for those that don't want to use an RS Bossk). This also leaves the Elite in play for squad building. And on a side note, I love the GMA idea for Bounty Hunters! I assume that would work with Double Claw and Rend for Bossk. That would be sweet! My vote is Trandoshan Huntmaster; RM Trandoshan Scavenger. The scavenger is never going to be used, and he has a clenched fist, denoting leadership. Just check out the Rebel Captain He is also looking back, possibly calling other trandoshans. New Zealand SWM for life! Trando Scavenger could work. His shirt is red! I don't see this mini as being Melee though, if he is he should be a real beefcake. Easy enough to cut off his sword and give him a gun. I can't really see the issue with using RS Bossk for the RM, because really there is no use for him whatsoever. He's cheap, I think I've picked him up for $1.99 at least once as custom fodder. Any depictions I've ever seen of Cradossk are basically Bossk in a red flight suit instead of yellow. And for 17 points there is never reason to play him, ever, not to mention the other 2 versions of Bossk. I certainly would rather not use a Nikto or a Noghri. The other non-Unique Trandos, pretty much stink but hopefully could see play because of this piece, but really Bossk will be the main benefit of any Trando abilities/synergies. Scott: Is Bossk a Trando and if not could he be? Trandoshan: A Trandoshan is any character with the word “Trandoshan” or “Bossk” in its name or that has the Trandoshan special ability. That's love! I had no idea Jason loved Bossk. I've got to ask, is Greedo a Rodian, Zuckuss a Gand, Thrawn a Chiss, Plaguis a Muun? Last edited by R5Don4 on Tue Oct 30, 2012 4:20 pm, edited 1 time in total. Hey I was thinking about how absolute crap most of the non-Unique Trandos are and how they have Mercenary. We could make whatever CE we have for Bounty Hunters also be for Mercenaries. Aside from the Furious Assault insanity they don't have much going for them. And then the Trando Mercs can double dip with this mini commander. If he is non melee then he should have a gun.